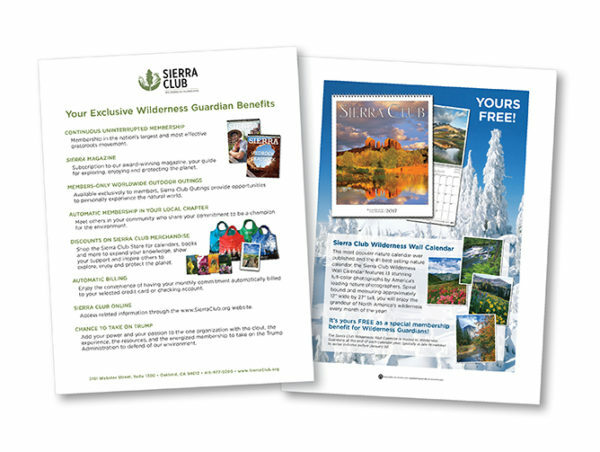 Sierra Club already had a robust monthly sustainer Wilderness Guardian (WG) program, however, a strategic decision was made to repurpose funds to invest more heavily in both new sustainer acquisition as well as existing donor conversion to pledge. In collaboration with MarkeTeam, a number of new strategic, creative and analytic approaches were instituted with great success. TELEMARKETING: To supplement monthly calling of new and reinstated donors with a sustainer ask, Sierra Club targeted a cohort of modeled warm prospects (petition signers) in its TM efforts that proved highly successful. Additionally, MarkeTeam developed a custom pledge TM model that identified a cohort of current long-term supporters for telemarketing that significantly improved pledge conversion rates. DIRECT MAIL: As mentioned above, the appeal effort during the Monthly Giving Month had a pledge ask for all recipients. In selected appeals throughout the year, cohorts identified by MarkeTeam’s pledge model were targeted to join the Wilderness Guardian program. Benefits of membership were included in the mail pieces and the donors were promised an introductory gift for joining. ONLINE: MarkeTeam developed a lookalike model for Sierra Club for online usage. MarkeTeam also developed a file of potential pledge donors that Sierra Club then uploaded to Facebook to create custom audiences who were then targeted for sustaining support. Additionally, Facebook used MarkeTeam’s pool to designate additional look-alike audiences who were also served sustainer asks. The multi-channel approach and investment led to a 16% increase in the number of new Wilderness Guardians in 2016 up to the Presidential election. Post-election and into 2017, Sierra Club redoubled its efforts, using MarkeTeam’s model for online ads, with sustainers increasing by over 250%. Compared to using Facebook’s internal look-alike modeling, Sierra Club’s cost to acquire using MarkeTeam’s look-alike modeling was reduced by more than 80%.